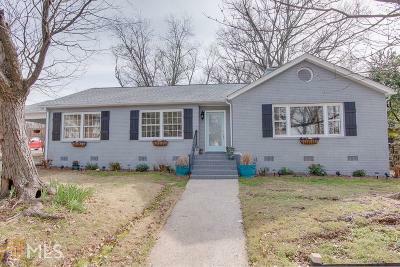 Adorable turn-key classic bungalow. This brick charmer comes with original oak floors, gorgeous fireplace, double pantry leading to large dining room with picture window and butler door to kitchen. Beautiful kitchen with white shaker cabinets, all SS high end appliances, including French door refrigerator, under mount sink, subway tile, granite counter-tops and vented industrial hood. Master with en-suite with basket weave tile and glassed walk-in shower. Sleek guest bath with marble style floor and smoky topaz glass tile. Literally minutes from Porsche HQ ,ATL airport and 75/85. Won't last long!